Sorry for the poor picture quality, I was in a hurry. Eh? Name of the store is Magic of Tricks. 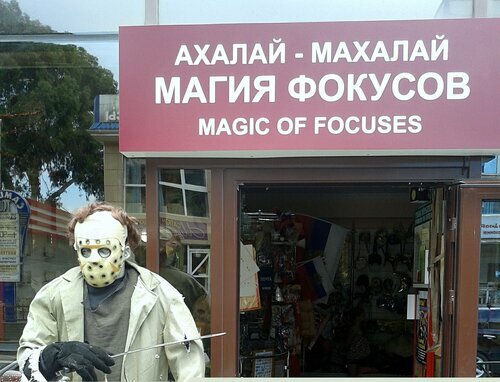 «Focus» in Russian also means hocus-pocus / trick. Eh? Sign in some school (apparently), requesting visitors to display ID document because of the increased crime rate. Would you understand this text? Btw, if you have experience with traveling to non-English speaking countries with bi-lingual signs, do you find it better/more useful when the names of streets, districts, buildings, etc. are translated or transliterated? Eh? Don’t worry, it’s not a call for action :) A typo, I presume..
Eh? «Golubye Dali» (Голубые Дали) residential district. The name translates as Blue Expanses. Eh? Many businesses are now required to be accessible to people with disabilities. 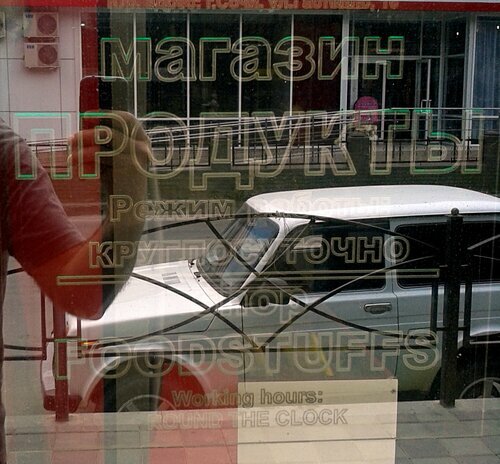 Pharmacies now have buttons to call for a sales person (who in Russia are required (?) to have medical education). Where? Pharmacy on near the international border with Abkhazia. Eh? Avia and Railway Tickets Office :) Travel agency of some sort. Where? Center of Adler district. Near Novy Vek shopping mall. Where? Adler, gym’s working hours.